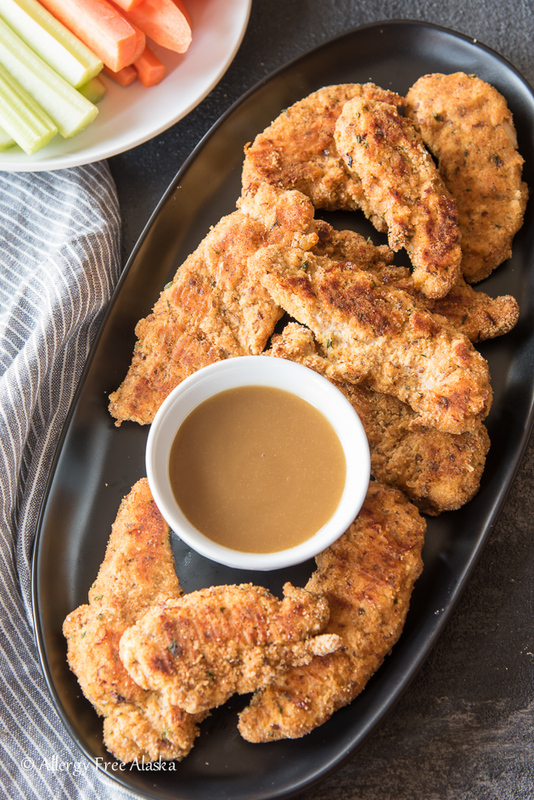 These easy baked Paleo Chicken Tenders are one of our favorite low-carb / Keto meals. 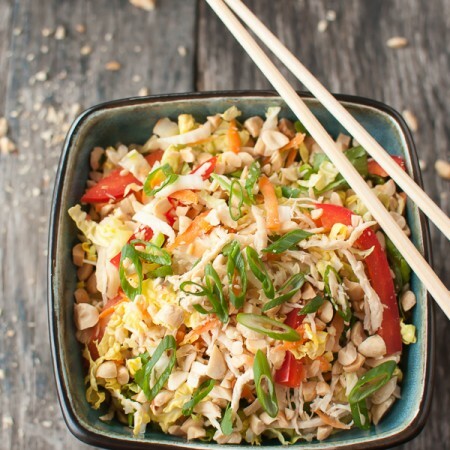 They are quick and easy, and much healthier than the fried variation! Do you remember what you ate in high school? I do. It’s scary to think what my diet mostly consisted of: saltines, goldfish crackers, mochas, Subway subs (I was a certified “sandwich artist”), whatever my mom could get me to eat, and chicken tenders and jojos (fried potato wedges) from our local grocery store deli. I loved those deli chicken tenders. Coated in gluten and soaked in hydrogenated fat (I know, they sound really appetizing when I put it that way). 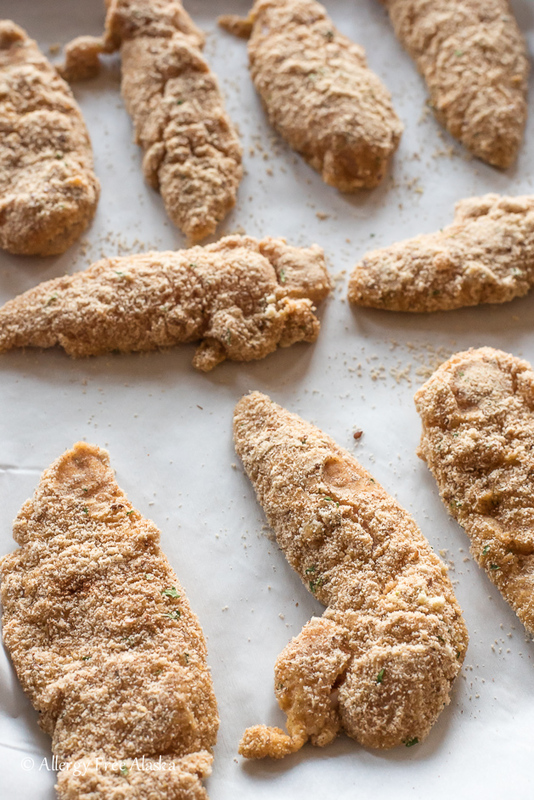 You will love these homemade gluten-free Paleo Chicken Fingers. The breading is flavorful and they are so easy to make; there’s no frying involved. If you use your fingers to bread the chicken, you might end up with breaded fingers instead of breaded chicken tenders. 😉 I use a fork to move the chicken around from the egg mixture to the breading, and then a spoon to help scoop the breading onto the chicken. That way my hands stay out of the mix as much as possible. I don’t recommend baking these in a glass dish. Use a metal baking sheet. Glass and metal conduct heat differently, so you won’t achieve the same results with a glass pan. The breading (dry mix only, not the liquid ingredients) can be mixed ahead of time and stored in an airtight container to save time on busy nights. If you are thinking of making an ingredient substitution, please continue to read below. Q: Can I leave out the flax meal? A: Yes, you can substitute a little more blanched almond flour in its place. Q: How can I make this recipe without the eggs? A: You might try substituting a starch slurry for the eggs. To make a starch slurry, combine arrowroot starch with cool water – just enough to make a slurry that will be the consistency of pancake batter. Not too watery, but not too thick either. After you dip the chicken tenders in the slurry, bread them as normal, per recipe directions. Q: How can I make these chicken tenders nut-free? A: If you can use blanched almond flour, you might try using a crushed up gluten-free cereal (like brown rice crispies or something similar to Corn Flakes). I haven’t tried it specifically in this recipe, but I have used it in another recipe for fish sticks, and it worked out well. I also had a friend who used ground up sunflower seeds in place of the blanched almond flour, and she loved them! Q: Is coconut flour a good substitute for the blanched almond flour? A: NO! Blanched almond flour is high in natural fats due to the almonds. Coconut flour is very drying and needs tons of moisture. I don’t recommend substituting coconut flour for the blanched almond flour. Q: Can you freeze these and reheat them later? A: I’ve actually never tried it! If you do want to try it, I’d recommend under baking the chicken tenders by just a couple minutes, otherwise when you reheat them they might be too dry. So maybe try baking 7 minutes per side, then freezing and reheating. 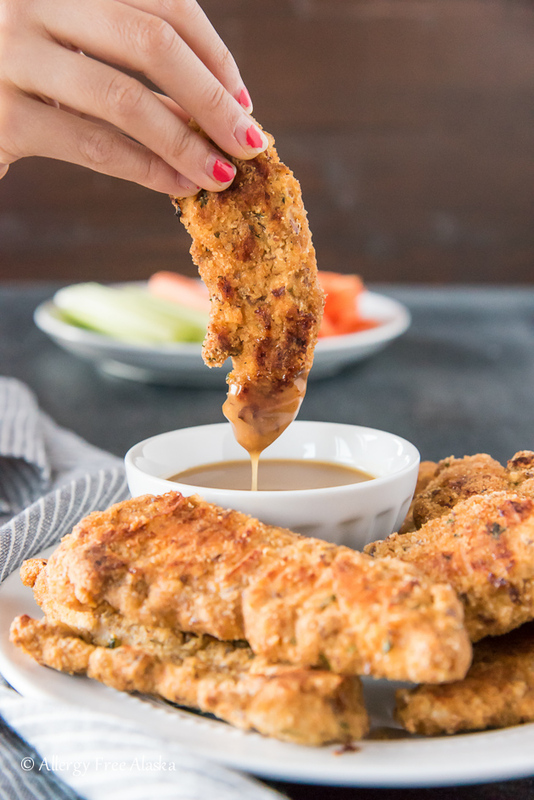 FYI: (This dipping sauce is NOT Whole30 approved, but the chicken tenders (recipe below) are. In a small mixing bowl, whisk together the honey and Dijon. Serve immediately or place in the refrigerator for later use. This dipping sauce is sweet; a little of it goes a long way. If it’s too sweet for your taste, try adding a tablespoon of mayonnaise to tone it down. Preheat oven to 425 degrees (F) and line 2 large baking sheets with parchment paper. In a pie plate or another shallow wide bowl, mix together the almond flour, flax meal, paprika, garlic powder, sea salt, parsley, poultry seasoning, and ground black pepper. Divide the breaded chicken tenders up between the 2 baking sheets and lightly spray with olive oil. Place in the oven and bake for 8-9 minutes. Flip the tenders over, lightly spray again with olive oil and bake for another 8-9 minutes, or until the internal temperature reaches 180 degrees (F). 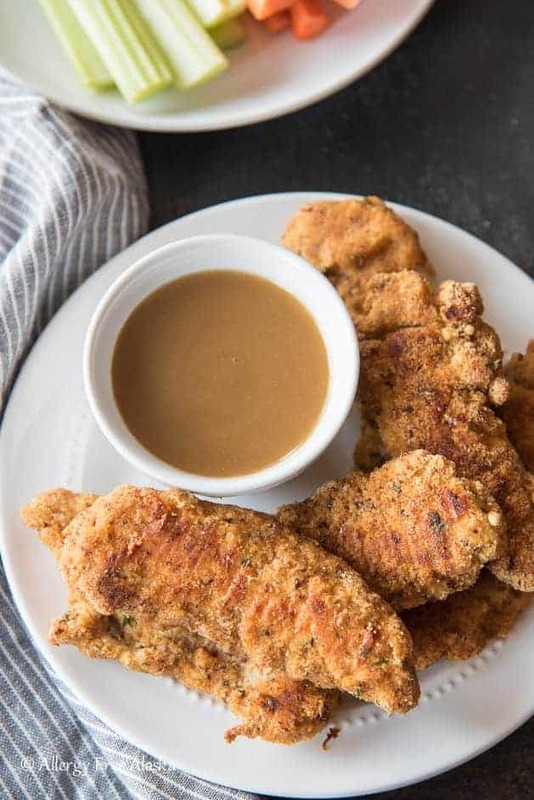 These chicken tenders never become really crisp, but with the tasty breading, they quickly will become a family favorite! 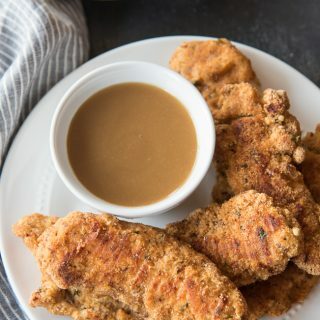 “Breaded” and baked chicken tenders-a family favorite we gave up when we went gluten-free. But thanks to you I guess we don’t have to!!! Love that you used almond flour Megan and paprika and poultry seasoning are great additions to make the chicken super tasty. I wish I had these ready and made at my house for our lunch today! We gave them up when we went GF too, Laura! It’s so nice to be able to have them again. I think chicken tenders are the perfect finger food! Hi Megan? Adding tapioca starch to the almond meal and flax meal (equal amounts) will give your chicken tenders that crunch it’s missing!! I use this on oven “fried” pork chops as well. Both come out flavorful, crunchy, and delicious!!!? This is a great idea. I have made something similar using crushed Gluten Free Corn Flakes which added a crunchiness. My little one will love these!! We haven’t had nuggets/tenders since I went grain-free a few months ago. I will have to put these on our menu soon. Thanks! I wonder if pre-toasting the almond flour might help? i would think if it’s not too fine it would toast…..
Oh Megan!!! These look so amazing. WOW! I am definitely going to try these. What a great lunch option during the week for my kiddos. And honey mustard is my all-time favorite dip!! I make it regularly and smother it over chicken. The perfect mix of sweet and sour…just can’t get enough. Hey Amber, thank you! Yes, my girls love these, so they would be a wonderful lunch option for your kiddos! I hope you guys are doing well!! These sound delicious and I want to try them. But, do you have a nut-free flour suggestion since we have to be both gluten-free and peanut/tree nut free? My children are also allergic to tree nuts. I wonder if coconut flour would work as well as Almond flour. I will have to give these a try. Thanks for the great idea! I’m not sure about using coconut flour, but maybe a combination of flax meal and unsweetened shredded coconut? Or even crushed gluten free cereal (like brown rice crispies or Arrowhead Mills Maple Buckwheat Flakes). I haven’t tried the crushed cereal specifically in this recipe, but I have tried it in others (like fish sticks) and have been successful. Good luck! The Coconut Flour does make a very good coating for the chicken. I have used it several times. But the coconut shreds would add texture to the coating. So, Maybe try the coconut flour and shredded coconut together. The resulting coconut chicken would have a wonderful taste. That’s great to know, Mark! Thanks for sharing! Coconut flour is usually not a good option in recipes like these. It’s extremely dense and dry. In baking, you usually use about 1/6 – 1/4 the amount of coconut flour you would use in other recipes… this screws up ratios of ingredients and flavors, plus very little to dredge with. If you are going to use coconut flour try to find recipes specifically written for it. You will have better luck. I think the gf crushed cereal would give you results closer to what you are looking for. I made these for dinner last night. I didn’t make the sauce, just served them plain. I also put them on a rack in the pan so they would cook on the underside instead of turning them over ½ way through cooking. They are fantastic! I love using almond flour. Thanks for a great recipe. You are so very welcome! Thank you for the wonderful review. 🙂 I’m so glad you enjoyed them. Have you tried freezing these and reheating them later? Just curious how they might hold up. No, I haven’t tried it, but I’m curious myself. If you do try it, I’d recommend under baking them by just a couple minutes, otherwise when you reheat them they might be too dry. So maybe try baking 7 minutes per side, then freezing and reheating. If you try it, please let me know! Megan, I made these chicken tenders tonight. They are phenomenal! I will make them again and again for sure. They will be great for a quick and easy dinner and also for lunches. Thank you so much, dear!! This note was such an awesome surprise – especially coming from you! ((Hugs)) Thank you for trying them and for leaving me such a wonderful review! I’m so glad you enjoyed them! I’m allergic to almonds and eggs. I have hazelnut flour, so would that work? Can I use an egg substitute, like flax gel? I’m wondering the same thing-no egg here! Made this recipe last night. AMAZING!!!! Wonderful, fabulous, easy, delicious, more happy yummy words…. I used sunflower seeds instead of almond flour (can’t digest), worked great. Your spice mix is so, SO yummy. Thanks for a great recipe!! My family thanks you too. Have a great weekend. We are heading out of town soon. See ya next week. Can’t wait to try these…can you tell me what “blanched” almond flour is. I have regular almond flour. Blanched almond flour are almonds that have been blanched (boiled) and then the skins removed before grinding them into flour. I’d imagine that your regular almond flour would work just fine though. 😉 I can’t wait to hear how you like them! These are amazing and much better than I thought they would be. I will be making these again for sure. These sound great! Is the honey mustard dipping sauce Paleo as well? Yes – as long as you use gluten free/paleo approved dijon. Do you have the nutritional values? I am supposed to be watching my carb intake. Thanks so much!! Hi Tina, no, sorry I do not! Amazing! I “tricked” my family and didn’t tell them until AFTER they were oooing and aaaaahing that it was almond flour. They have been resisting me for so long on going glutin free.. Last week was rice pasta… Won that… And this week was almond flour… Won that! This recipe is not just for kids it’s amazing. Instead of olive oil I use coconut oil spray gives a complimentary taste and doubled nicely with my side of oven baked sweet potato wedges with Celtic sea salt and coconut oil. Oh almost forgot, on my second batch.. Yes second. They requested more for taking for lunch tomorrow!!! I added 4 times the flax and they tasted just the same.. Double win! Thank you for this!!! Can’t wait to see what other goodies I can find on your page! Do you think u can use almond meal flour? Almond meal should be fine, but the consistency of your breading might be a little different. I recommend Honeyville Blanched Almond Flour. I use a fork to move the chicken around from the egg mixture to the breading, and then a spoon to help scoop the breading onto the chicken. That way my hands stay out of the mix as much as possible. Also make sure you’re using Honeyville Almond Flour. It has a finer texture than other brands and won’t clump as much! Hope that helps! Megan I love all your recipes! I made your chicken strips tonight and my husband told me three different times that they were SO good! Thank you for making our gluten and dairy free life so much easier. That makes me so happy Kirsten! 😉 You are very welcome and I’m very happy to do so! Thanks for commenting! I made these tonight for my son. They were ANAZING! We only had unblanched almond flour, I’m not sure what the difference but it still tasted great. My five year old couldn’t shovel them in fast enough, the sauce was very flavorful as well. Made the chicken tenders a few days ago. I am making them again as I am e mailing. Very good! Thank you, Linda! 😉 Glad you enjoyed them! Can you make the dry mixture ahead of time and keep it sealed and just pour it in a bowl and use as needed? These were a huge hit with my family tonight! Thanks for sharing such a yummy recipe! Did it for dinner tonight, and it’s sooo goood!!!! Everyone in my house thinks these are fantastic! Definitely a new favorite! An allergy-friendly recipe with eggs and almond flour????? Ugggghhhhh. My husband and I have been on the paleo diet every since I got really serious about losing my baby weight from my darling son. This chicken was delicious- better than any recipe I’ve made that include breadcrumbs- and I can’t wait to make it again! I made it with boneless dark meat cutlets and it came out great! We’ve made these twice with flax-eggs. The first time, one out of the four pieces had the breading fall off. The next time, we put the damp chicken in arrowroot before putting them in the flax-egg. They worked great. Another tip, from Sara Moulton. When making something like this, it helps to put them in the fridge for an hour or more before putting in the oven. I’ve found that really helps keep the breading on. Also, since we don’t use parchment paper because of the silicon in it, we used plenty of avocado oil on the cookie sheet and they crisped up really nice. Thank you for this recipe. We are making them again tomorrow. Cannot wait to make these. Recently found out that my daughter cannot have gluten/dairy/sugars. She was devastated about having to give up her chicken nuggets. She will be thrilled if they taste as good as they sound like they do! Thanks so very much! I have made these about 5 times. My whole family likes them, which is no small feat! They are delicious. I do have issues with the breading falling off but they are great. Any tips for the breaking would be great. Thanks. can you use gluten free oat flour instead of almond flour? These chicken fingers are terrific! Great dipping sauce. I haven’t had chicken fingers since I went GF almost two years ago. Thanks! Hi Denise, you’re very welcome! Happy to hear you enjoyed them! I wouldn’t recommend using coconut flour in this recipe. Maybe sunflower seed flour, or unsweetened shredded coconut instead? You might need to experiment with the recipe a bit to find something that works for you. any suggestions for a egg replacement? I tried olive oil and it didnt work. You could try a starch slurry (arrowroot starch + water), or coconut milk. I haven’t tried either though, so I’m not sure they will work. I made these for dinner last night and they were amazing! I baked sweet potato fries at the same time because you can’t have chicken tenders without fries. Thanks for the recipe! 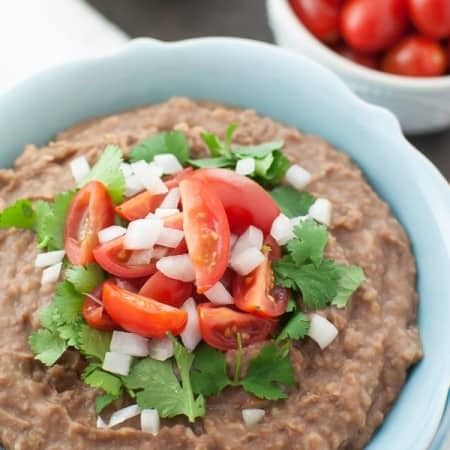 Came across your site from a recipe posted on the Fitness Magazine website for a different recipe but happened to make this one instead this weekend. Super easy to make and when I pulled them out of the oven, they looked exactly like your pictures! So needless to say I was super excited to try them for lunch the next day. I reheated them and they were delicious however the “breading” came off so I’m wondering if I should have let them cool longer before putting them in the fridge or if this is just a result of not eating them right away. Hmm. Either way, will definitely be making these again and again. I passed on the sauce and just had them with some baked sweet potato for lunch. So glad I found your site! I’m glad you found me and happy to hear you enjoyed this recipe! 😉 The breading does tend to fall off the next day; however, if you let them cool completely before storing in the refrigerator, they might hold onto the breading just a bit better. Hope that helps! I specifically drove 40 miles into the nearest grocery store to get the ingredients for this AND I AM SO HAPPY I DID. It is soooooo delicious. I could eat all two pounds of this myself. That’s a long ways to go for ingredients! 😉 I’m VERY happy you enjoyed them! has anyone figured out the calorie count for this ? These are really good!! Even my family who always cringes at gluten free things I make gobbled them up! Thank you! Don you have any suggestions for an egg replacement in this recipe? An egg-free mayonnaise, like Vegenaise, would probably work just fine as a sub for the eggs. It would be wet enough that the breading would stick to it. Just keep in mind I haven’t tried it myself! Very good. Turned out perfect recipe/instructions very easy to follow. I just want to say that these chicken tenders always help get me and my family through the Whole 30. My kids tend to shy away from Whole 30 recipes but these are an exception. Thanks so much for this awesome recipe! That’s the best compliment, Ashley. I’m so happy this recipe helped you! Hi! I was wondering if you could tell me how many calories this is per serving? And what the serving size is? Thank you! My family and I loved these! I’m gluten free and on a low carb diet so these were a big hit. It took me A LOT longer than the stated prep time to chop the chicken and dreg them and I ended up needing twice the amount of dry ingredients as it called for. I eliminated the flax meal because I didn’t have any and they were great. I didn’t have a spray bottle so I coated the parchment paper with olive oil. It worked fairly well but smoked a lot and and stuck a bit. My kids want this to be a regular meal now.